This article is about frozen ground. For other uses, see Permafrost . 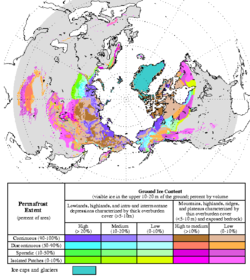 The extent of permafrost can vary as the climate changes. Today, a considerable area of the Arctic is covered by permafrost (including discontinuous permafrost). Overlying permafrost is a thin active layer that seasonally thaws during the summer. Plant life can be supported only within the active layer since growth can occur only in soil that is fully thawed for some part of the year. Thickness of the active layer varies by year and location, but is typically thick. In areas of continuous permafrost and harsh winters the depth of the permafrost can be as much as in the northern Lena and Yana River basins in Siberia . Permafrost can also be a storage of carbon. One estimate is that 1700 Gt of carbon are stored within the permafrost worldwide. Permafrost will typically form in any climate where the mean annual air temperature is less than the freezing point of water. Exceptions are found in moist-wintered forest climates, such as in Northern Scandinavia and North-Eastern Russia west of the Urals , where snow acts as an insulating blanket. The bottoms of many glaciers can also be free of permafrost. Typically, the below-ground temperature will be less variable from season to season than the air temperature, with temperatures tending to increase with depth. Thus, if the mean annual air temperature is only slightly below , permafrost will form only in spots that are sheltered — usually with a northerly aspect. This creates what is known as discontinuous permafrost. Usually, permafrost will remain discontinuous in a climate where the mean annual soil surface temperature is between . In the moist-wintered areas mentioned before, there may not be even discontinuous permafrost down to . Discontinuous permafrost is often further divided into extensive discontinuous permafrost, where permafrost covers between 50 and 90 percent of the landscape and is usually found in areas with mean annual temperatures between , and sporadic permafrost, where permafrost cover is less than 50 percent of the landscape and typically occurs at mean annual temperatures between . In soil science, the sporadic permafrost zone is abbreviated SPZ and the extensive discontinuous permafrost zone DPZ. A line of continuous permafrost in the Northern Hemisphere (Frozen Ground 28, 2004, p5) is formed from the most northerly points at which permafrost sometimes thaws or is interrupted by regions without permafrost. North of this line all land is covered by permafrost or glacial ice. The "line" of continuous permafrost lies further north at some longitudes than others and can gradually move northward or southward due to regional climatic changes. In the southern hemisphere , most of the equivalent line would fall within the Southern Ocean if there were land there. Most of the Antarctic continent is overlain by glaciers. In the Andes at Atacama Desert permafrost extends down to an altitude of 4,400 metres and is continuous above 5,600 metres. In Yukon , the zone of continuous permafrost has moved 100 kilometers poleward since 1899, but accurate records only go back 30 years. It is thought that permafrost thawing could exacerbate global warming by releasing methane and other hydrocarbons, which are powerful greenhouse gases. It also could encourage erosion because permafrost lends stability to barren Arctic slopes. At the Last Glacial Maximum, continuous permafrost covered a much greater area than it does today, covering all of ice-free Europe south to about Szeged (southeastern Hungary) and the Sea of Azov (then dry land) and China south to Beijing. In North America, only an extremely narrow belt of permafrost existed south of the ice sheet at about the latitude of New Jersey through southern Iowa and northern Missouri . In the southern hemisphere, there is some evidence for former permafrost from this period in central Otago and Argentine Patagonia, but was probably discontinuous. Formation of permafrost has significant consequences for ecological systems, primarily due to constraints imposed upon rooting zones, but also due to limitations on den and burrow geometries for fauna requiring subsurface homes. Of course, there are secondary effects from species dependent on plants and animals whose habitat is constrained by the permafrost. One of the most widespread examples is the dominance of Black Spruce in extensive permafrost areas, since this species can tolerate a more near surface constrained rooting pattern. It has been calculated that the time required to form the deep permafrost underlying Prudhoe Bay, Alaska is 500,740 years. This time extends over several glacial and interglacial cycles of the Pleistocene and suggests that the present climate of Prudhoe Bay is probably considerably warmer than it has been on average over that period. Such warming over the past 15,000 years is widely accepted.The table to the right shows that the first hundred metres of permafrost forms relatively quickly but that deeper levels take progressively longer. Building on permafrost is difficult due to the heat of the building (or pipeline) melting the permafrost and sinking. This problem has three common solutions: using foundations on wood piles; building on a thick gravel pad (usually 1-2 meters/3.3-6.6 feet thick); or using anhydrous ammonia heat pipes. The Trans-Alaska Pipeline System uses insulated heat pipes to prevent the pipeline from sinking. Qingzang railway in Tibet was built using a variety of methods to keep the ground cool. At the Permafrost Research Institute in Yakutsk , it has been found that the sinking of large buildings into the ground (known to the Yakuts before Yakutsk was founded) can be prevented by using stilts extending down to about fifteen metres or more. At this depth the temperature does not change with the seasons, remaining at about -5 °C (23F).